I get the feeling this is going to be one of those weeks. Ugh! Maybe the beginning of October is going to better. But I am not going to run away and hide in a hole (but oh I wish I could). Nope, I want to share with you these exciting pieces. I had never before seen this ghost piece by Starck. It would be a perfect bedside table. And the greek key box is an instant classic. That would be ideal anywhere in your home. And if you want some luxury for yourself, these high heels blew me away. They are futuristic and seem really comfortable. And that little clutch is just the right amount of shiny and whimsical elegance to dress up any evening ensemble. 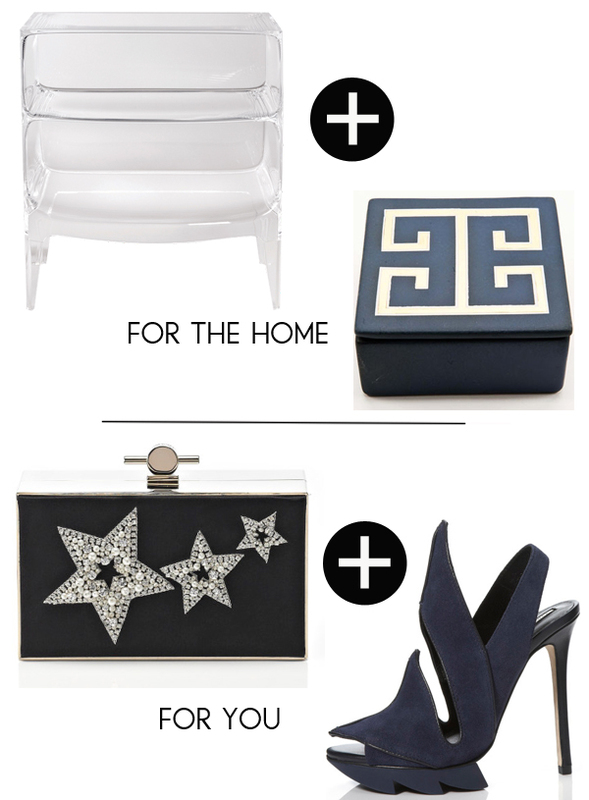 I just love that Greek key box and that clutch! Thank you for sharing Albertina! Lawd a mercy lady! Those shoes are killer! I could just pair them with that black dress you recommended the other day. Maybe you should add personal shopper to your resume? i'm just saying. More than obsessed with that Greek key box! Those shoes are amazing! HaHa I hope things get better for you :) I predict a wonderful October heading your way. Have a great day! Cute clutch! Hope your days get better :) Have an amazing Tuesday ! Que hacías despierta a las 4 de mañana??? Que haces despierta a las 4 de la mañana?????? Tengo ganas de irme a comprar los zapatos en ambulancia! Oh my! What is going on with that nightstand?? Love!! Oh my! What is going on with that Lucite nightstand? Love!! Love these pieces AND it is one of those weeks. Trust me when I say! Hang in there! I'm having one of those weeks as well! That nightstand is too great for words. Fabulous! Am I allowed to say it is one of those weeks, too? Because my parents are visiting and they are driving me nuts. I can't blog about it because they will read it. Oh, and I want that lucite nightstand.